Now this is something really interesting: as found on Adobe Labs site, their technology codenamed Apollo is approaching Alpha status. What Apollo is – in a nutshell – is another virtual machine, similar to Java runtime or .Net framework, with few minor twists: it is multiplatform (as Java) as well as multi-language (as .Net) at the same time. Before flame wars start – I am aware that JVM is capable (more or less) to support multiple languages beyond Java and also that .Net is (more or less) capable running on non-Windows platforms (e.g. Mono project), but that is not the point. The point is what is different about the Apollo compared to JVM or CLR. The demonstration videos on Lynda.com show few interesting capabilities of new application types – follow the ‘Sample Apollo applications’ link and also here. 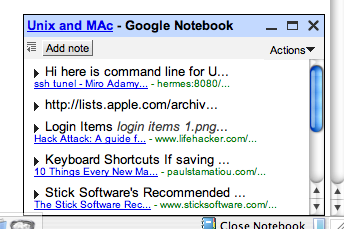 Today’s extension provides easy way how to access and add content to great free service from Google – Google Notebook. I am using it for over 3 months now and find it very useful and easy to use. As other Google product, Google Notebooks is simple, has clean interface and not too many features. 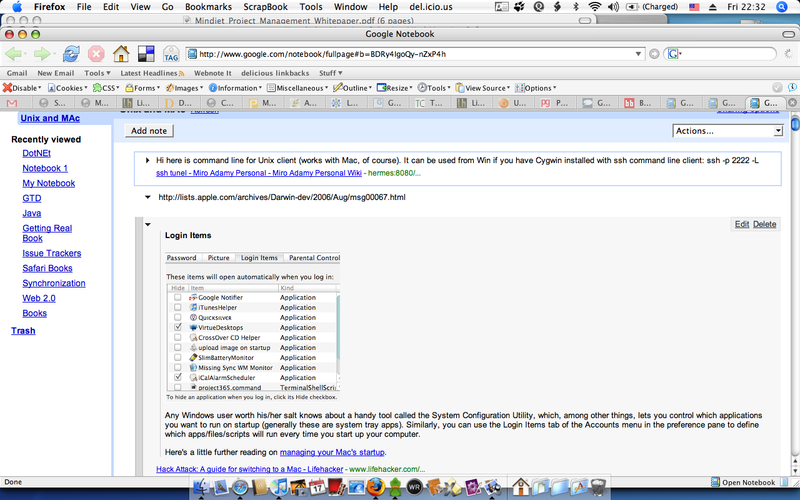 The extension available from Google tools for Firefox make using it even easier. It allows you to create notes – Web clippings, by selecting part of Web page and choosing “Note this (Google Notebook)” from context menu, selection is added to currently active notebook. Google notebook is providing very similar functionality as the Scrapbook extension – but it keeps all clippings on-line, which is both pro and cons. If you are using single computer, Scrapbook has an advantage of keeping saved pages available even when you are offline. It also gives you more options for managing clips: merge, import/export. GN allows only rearrange content, simple edit and print. As many other Google tools, Google Notebook does one thing and does it well. Saving Web clip can hardly be easier. If you do not need import/export and want to have access to your clips from any place, give it a try. This very simple extension allows you to enter multiple sets of text (such as e-mail signatures) and paste them into forms simply by right-clicking. Why is this such a big deal ? I am using GMail for both my personal and work stuff. To make sure my work related email appear as coming from company email address, I set the proper From address when composing an email. GMail can be configured to stay with the recipient address when replying. The only problem is signature. In private emails, I want to have link to the blog, in work emails, to company site. And GMail offers only one signature. With this extension, I do not use any signature from GMail, just simply insert correct one from the Clippings buffer. There are other solutions Gmail multiple signatures Greasemonkey script but they are quite heavyweight for simple problem (which was main reason I did not try them out). Get it at usual place. Today’s extension is one that most people do not know about – and still almost everybody has it installed. The explanation for both is that it is distributed with Firefox, and unless you specifically prevent it’s installation, you will get it. It is DOM Inspector. To open an inspector window for any page, select Tools->DOM Inspector and press ‘Inspect’ next to URL (it copies URL of the page you are on, but you can type in any URL). The window is divided in three panes – document tree, node properties and in lower panel the rendered HTML. Now you can walk through the document tree and see the node properties (and note that in rendered page a blinking red rectangle will highlight the node you are on). Or you can go the other way – click on the top left button (“Find a node …”) and then click anywhere in the rendered document – the tree will reveal position of the element you are on. This is very usefull especially when you are trying to locate the chunk of HTML buried deeply in nested structures of tables. So next time you will be trying to make sense of huge, complicated HTML source of a Web page, remember that help is only one click – Apple-Shift-I (or Ctrl-Shift-I for the Windows) – away. What is missing is the Referrer link – the foreign site will not know where you came from. Which may or may not be important. Other than that – the site will still get all information about your browser version and OS, which can be used (in case of malicious Web site) to render page that will try install spyware or virus or benefit from known browser exploits. Despite of that, Stealther is very useful to control cookies. In Firefox, you can set option that every attempt to set cookie can be examined and manually confirmed. If you decide to do that, you must have a patience of a saint, because browsing will become very annoying sequence of deciding whether you allow or disallow cookies. With Stealher, you can keep your browser setting on less draconian (and more practical) level and activate “cookie killer” on request, whenever you will enter zone of aggressive sites that may try to trace your digital pathways. Today’s extension is yet another one that somehow works with URL’s aka links. If you now have strange feeling that all extensions in last few days *were* about links, you are right. But realize that links are the most crucial feature of the Web, and therefore extensions dealing with links are really useful. 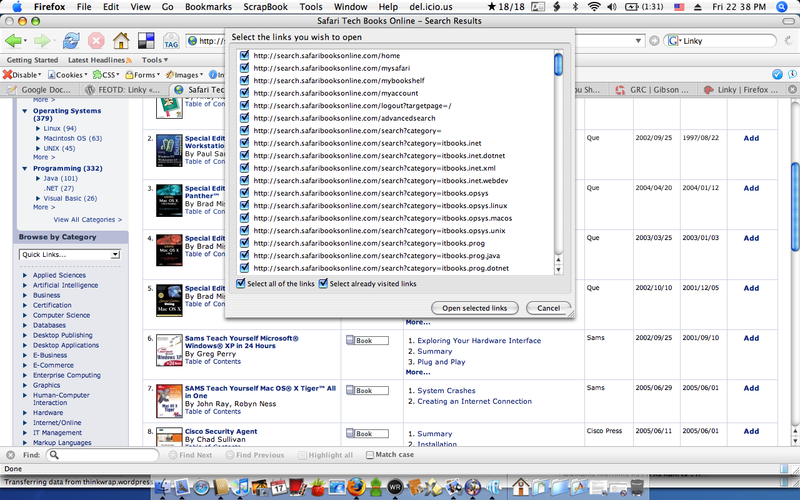 After you download Linky (the download is very small – only 32 kB), it adds few entries into your context menu. How many new menu entries are added can be configured in plugin option. On activation, Linky shows you number of links and image links (URL pointing to picture) on currently page displayed page and allows you to open links in new tabs or new windows or open image links in new tabs or windows. In both cases, Linky displays dialog window with all links and allows individual selection of which links will be included. If you before right-clicking on page (or Ctrl-Click if you are on Mac) select part of page, you can perform all actions mentioned above with links contained in selection. 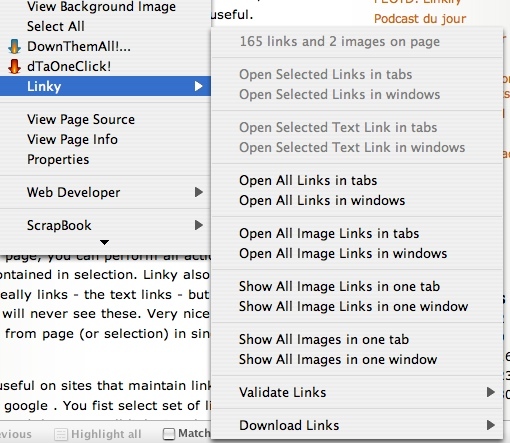 Linky also allows opening links that are not really links – the text links – but if you use Linkify plugin, you will never see these. Very nice feature is also opening all images from page (or selection) in single new window or single new tab. Linky is extremly useful on sites that maintain links – for example del.icio.us, digg or google . You fist select set of links by selecting the tags of interest and then open all links in tabs. While you read one tab, others are loaded in background. This is extremly efficient “wide surfing” which is very handy when you need to revies large amount of information without getting lost or distracted … The only downside is memory consumption. And now for something completely different: I visited Steve Gibson’s site and tried his very handy, free online security service. If you believe that your system or network is secure – verify it by visiting his site grc.com and checking whether your network shields are indeed up.